Join Us!!! We are looking for someone to help us cover Costa Rican basketball. Please send us an e-mail. 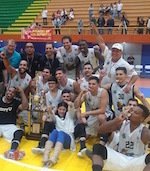 Coopenae-Arba celebrate 4th consecutive win at the start of the Liga Superior 2019. In the latest game they edged Abogados 81-42. Coopenae-Arba fully dominated the game and led 50-16 at the halftime. They enjoyed a 70-27 lead with 10 minutes to go and posted the fourth victory to keep the top position. Abogados and Escazu are with 3-1 record, while Siquirres have 1-3 record. Asobasca is winless at the moment with 0-3 record. SG Bergishe Loewen (Germany) agreed terms with experienced 35-year old international swingman Jermaine Barnes (193-95kg-83, college: Point, GA). Barnes just played at Tonga NT in the Copa Mitchell Cup (Dominican Republic). In five games he had very impressive stats: Score-5 (19.5ppg), 7.5rpg, Assists-1 (6.5apg), 2.3spg and 1.0bpg this season. This season he played at SG Bergishe Loewen (Germany) where in 17 games he recorded also remarkable stats: 27.0ppg, 8.0rpg and 5.0apg. Barnes' team won Mitchell Americas Cup for five years in a row (between 2015 and 2019). He was voted Latinbasket.com All-Mitchell Americas Cup 1st Team in 2017, 2018 and 2019.